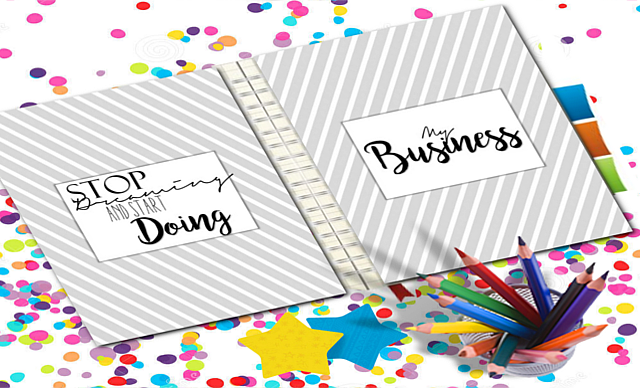 Are you ready to bust out of your rut and start planning your business like one of the cool kids? Whether you are a business pro, Etsy shop operator, online entrepreneur, or a newbie just getting started the EPIC business planner kit will help you stay focused, organized, and in complete control! So what makes this Business planner stand out over all the rest? Well, it's efficient, effective and it isn't redundant. I finally realized I don't need a section for every network, multiple advertising expense pages, or a section after section of repetitive forms renamed.. Instead you have one streamline planner that covers everything. No more flipping through network pages, or confusing layouts. 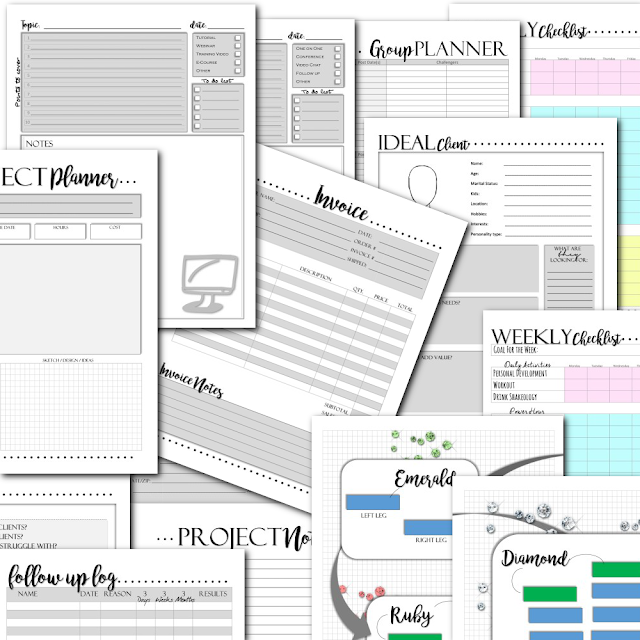 Just one streamline planner that will fit just about every business! This is an overview of your yearly business goals, 12-month goal map, and all your personal branding details! Business Cover with quote (2 pages): The front side says “My business” and the back side has a quote. Business Goals (1 page): These are your entire list of goals for the year broken down by month. Business 1-year Goal map (2 pages): Where do you want to be in one month? Three months? 6 months? And 12 months? What are your benchmark goals? Brand Brief (1 page): This is a breakdown of your business. Who you are, what you are doing, and your mission. Remember, if you are working in direct sales… BRAND yourself, not the company! Brand Style (1 page): This is a style sheet for your brand. Check out other brands you love and see what they are doing and start designing your cohesive brand style. Think about colors, patters, and font. Brand Story (1 page): This is 4 questions to telling your brand story. Do you struggle with conveying to others what you are all about? Well here is where you will create your EPIC brand story, that way when it comes time to share with someone what you are all about it’s right there…. Re-Branding questions (1 page): Are you thinking about rebranding? These questions will help you decide if it’s time to try something new! Business Notes Section (6 Pages): This is a notes section for you to jot down notes or ideas for your business. This section is your monthly financial management system that is conveniently located all in one place! Track your income, expenses, advertising costs and MORE with ease! I print this section off and add it to my 12-month agenda each month. Business Editorial Calendar (1 page) This is a monthly editorial calendar for your business. You can track payment due dates, events, and MORE! Business Idea Map (1 Page) Here you can map your monthly business ideas! Income Log (2 pages) Log your monthly income. Expense log (2 pages) Track your monthly expenses. Sales Log (2 pages) Log all your sales. Coupons and Discounts (1 page) Keep track of your coupons and discounts. Sponsored and giveaways (1 page) Manage your sponsored posts and giveaways. Inventory (2 pages) Keep track of your inventory. Invoice (1 page) Print an invoice to send with your customer’s purchase. Custom order invoice (1 page) Print an invoice to send with a customer order. 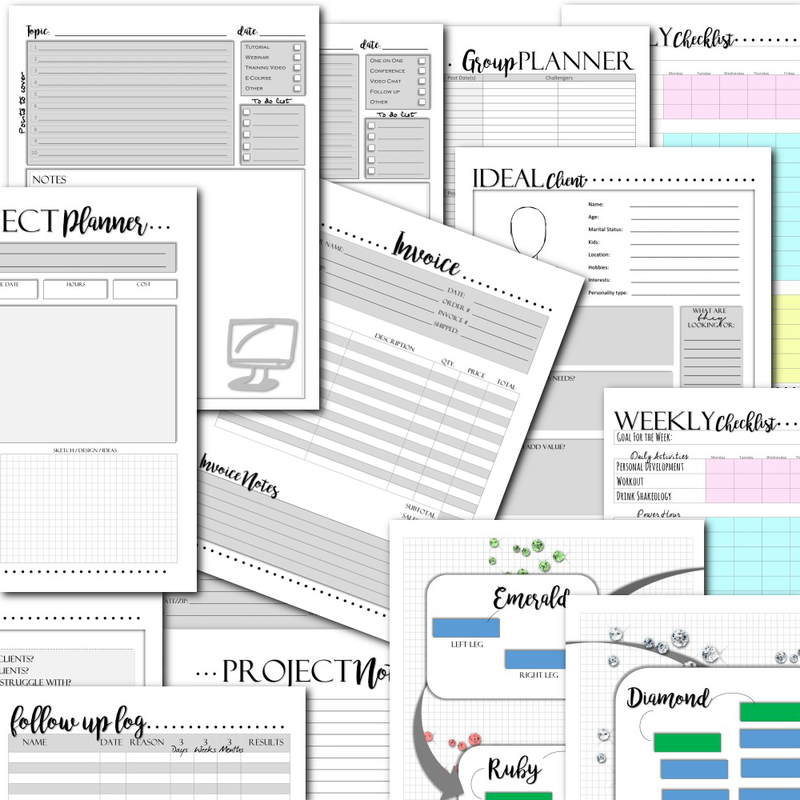 Project planner (2 pages) Use the project planner to plan a project, custom order, or freelance job. 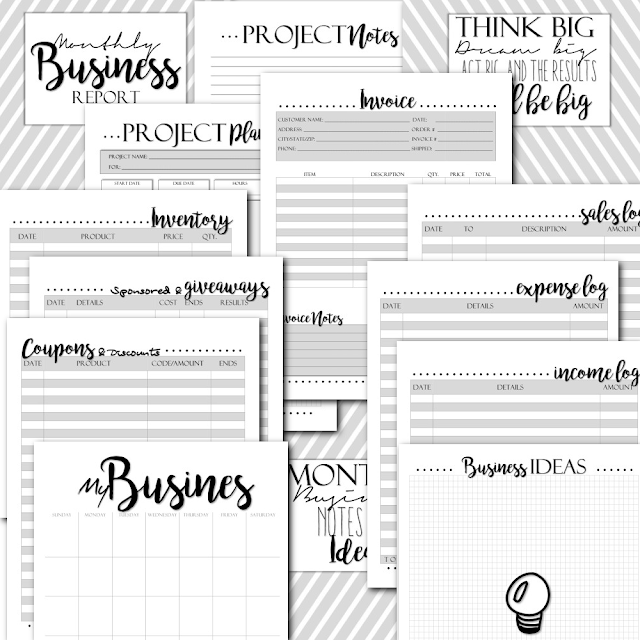 Monthly Business Notes (6 pages) Use these note pages to jot down ideas, thoughts, or plans for your monthly business. This is your social media management DASHBOARD! Instead of having NUMEROUS sections for each individual network and similar pages in each section I decided to create one management system to handle everything!! You can plan all your network posts on one page. Not only that, but you can also manage all your networks on one dashboard, create a uniform theme and preform page maintenance where it's needed. Honestly you don't need a twitter, facebook, and instagram section... you can manage it ALL together. Social Media cover with quote (2 pages) Section cover with quote on the second page. Social Media Goal Map (1 page) Here you can map your monthly social media goals. Network manager Dashboard (2 pages) HERE you can track all your networks, manage your posting themes, plan page maintenance and SO much more! I seriously LOVE this page! Social Media 31* day agenda (9 Pages) This bad boy is a social networking dream. It’s a 31-day vertical posting planner. You can plan your posts each day for multiple networks all on the same page! This comes loaded with networks. Contact me if you would like a blank one. I included my personal one, one with blogger, and one with WordPress. Tags, Hashtags, and keyword log (2 pages) Keep all of your tags, hashtags, and keywords all in one place! Post Planner (4 pages) You can use this post planner to plan network posts or blog posts. 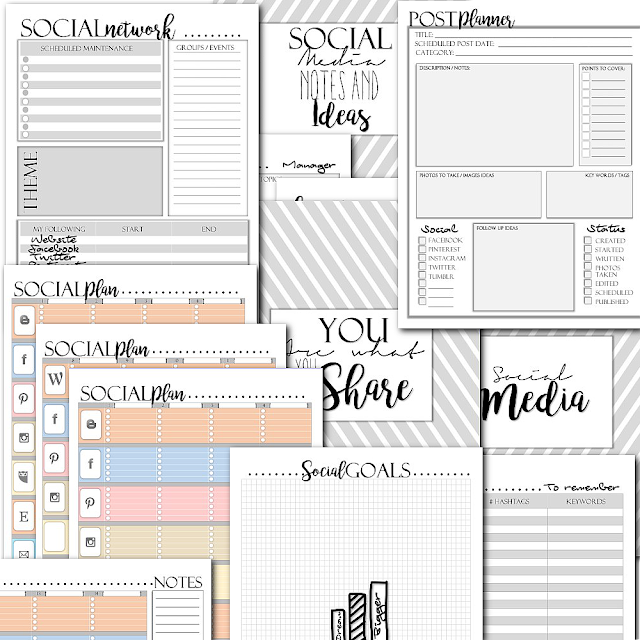 Social media Notes and Ideas cover (6 pages) Use this section to jot down notes, ideas, or future networking plans! Whether you are working with contacts, customers, clients, affiliates, or coaches I have you COVERED! I put this section in the very back of my binder, but you can put it wherever you want. Contact Section (6 pages): This section includes a two sided cover, and a 4-page contact sheet. 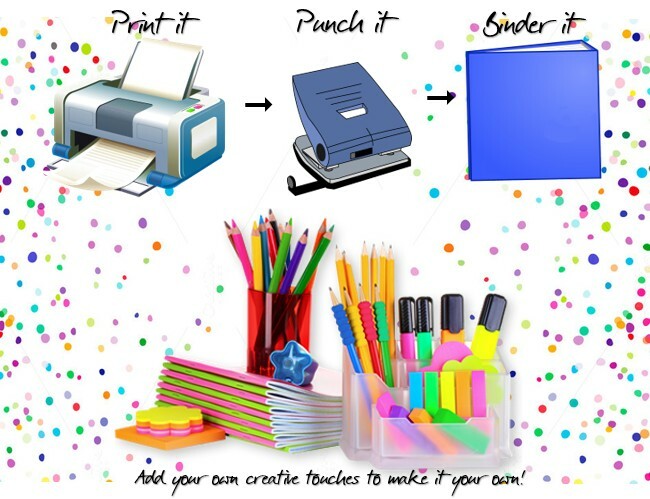 You can always print more and add them in! 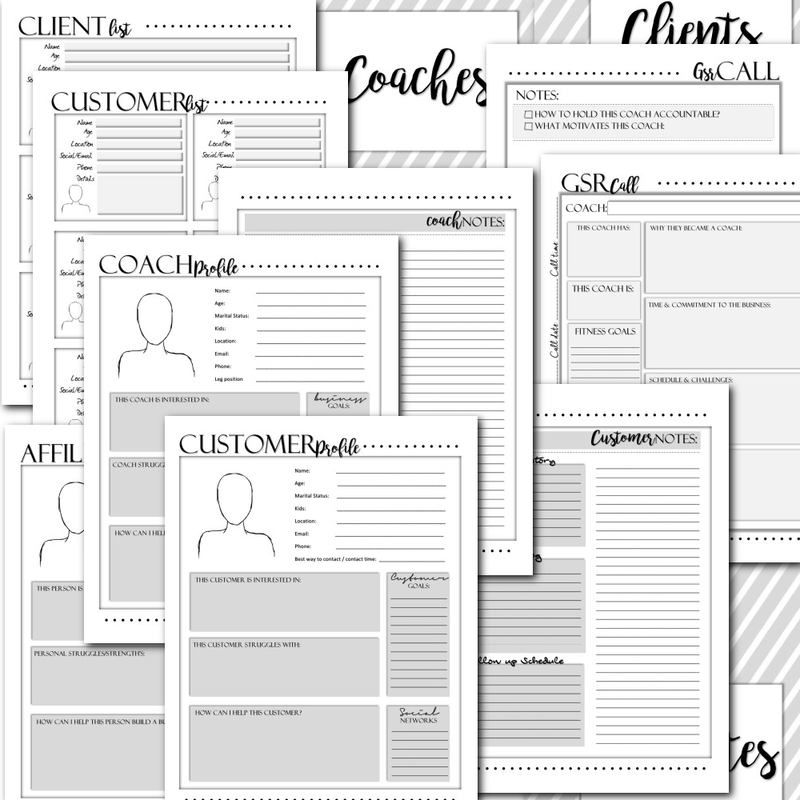 Customer Section (10 pages* bonus additional customer notes 2 pages) This section includes a 2 page cover, 4-page customer list, and customer profiles. You can use the customer profile page to track customer details, order history, and schedule follow-ups. Client Section (10 pages* bonus additional client notes 2 pages) Don’t like the word customer? Prefer clients? Well this section is identical to the customer section except it’s titled “clients”. Affiliate Section (6 pages) Are you building a team of affiliates or customer reps? Then you will want to use the affiliate section to profile all the associates under you. Track their goals, product use, and find creatives ways to keep them on track based on their individual needs! This section includes a cover and affiliate profile pages. Coach Section (10 pages) Are you building a team of coaches? Track your team’s business goals, what motivates them, and any other details you can think of! This section includes a cover, coach profile, and GSR (getting started right) call sheet. Managing your downline just got simplified! This section is for all you Etsy shop owners! If you don’t have a shop you can just leave this section out. I also put this section in either the very front or the very back of my binder. It’s more of a shop overview section. I use the monthly business section for all my financials. I just don’t see the point of having multiple sections with the same files! Etsy shop cover with quote (2 pages) Two-page cover with motivational quote on the second page. Etsy Editorial Calendar (1 page) This is a blank editorial calendar to schedule product release dates, events, advertising info etc. 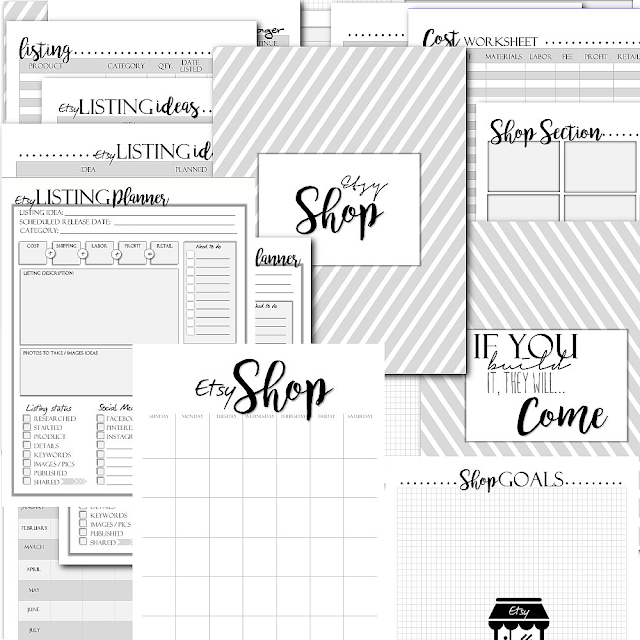 Etsy Shop Goals (1 page) Here you can map your shops goals. What would you like to do? What new listings are you working on? Are you expanding? It’s time to map your goals! Etsy Shop Section Manager (1page) Manage all of your etsy shop sections to keep your listings organized and easy to find! Etsy Listing Manager (2 pages) Here you can manage and track all of your shop listings. Etsy Listing Ideas (2 pages) Brainstorm new listing ideas! Etsy Listing cost worksheet (2 pages) Here you can work out the all your listing cost details. Etsy Shop stats (1 pages) Track your monthly shop stats all on one page. Etsy Shop Notes (6 pages) Here you can jot down ideas, plans, or brainstorm new listings! 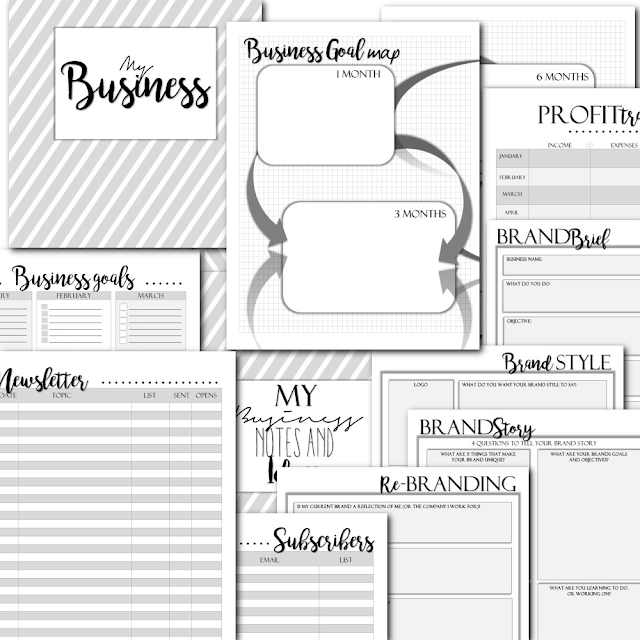 These are additional business forms that can be added into your planner. Font Tracker (2 pages) if you download a LOT of font you need this! I am constantly forgetting about all the cool fonts I download. Here you can keep track of them and how you plan to use them. Power Hour 31-day Checklist (1 page) Here you can plan your power hour. What are the things you need to get done and are you doing them daily? List your power hour tasks and start tracking them to build your consistency. 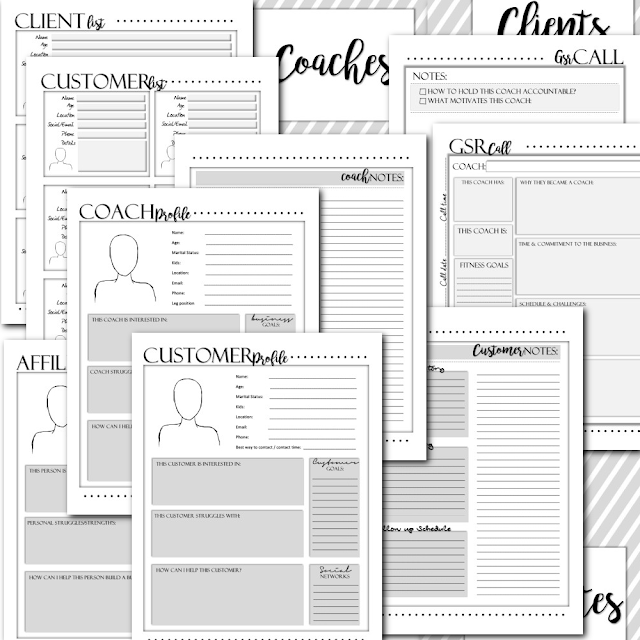 Ideal Client worksheet (2 pages) Here you can define your ideal client. Who are they? What are they interested in? How can you better gear your marketing for them? Follow up form (2 pages) Do you need to follow up with your customers or clients? Then you can use this form to log and track your follow ups. There is a great 3 day, 3 week, 3 month follow up schedule that you can use to keep in touch with those who are interested in what you have to offer! Group Manager (1 page) If you are a member of several online groups you can use this sheet to manage them. That way you don’t forget about any of your groups ever again! Challenger Check-in (1 page) If you run challenge groups this is a great sheet to use to track your challengers check in within your group. If you see someone hasn’t be active then it’s time to reach out and see what is going on. Call planner form (2 pages) Here you can plan calls with your team, customers, clients or anyone else you need to call for your business. Video, webinar, tutorial planner form (2 pages) You can use this sheet to plan your video’s, webinars, tutorials, and MORE! Weekly Business Checklist (1 page) Blank weekly business checklist broken down by priorities, power hour, and other activities. Rank map worksheet (Beachbody 2 pages) This is a worksheet for rank advancement. Emerald, Ruby, Diamond. Weekly Business Checklist (Beachbody partially filled in) (1 page) weekly business checklist broken down by priorities, power hour, and other activities. THERE you have it! My NEW favorite way to plan my business, social media, and etsy shop! Once purchased, these pages can be printed over and over on 8.5 x 11 inch paper or A5 (Both letter and A5 sizes are included). I am trying to pick, but I am confused. What is the difference between Epic Business planner, Coach yearly business planner, ultimate coach planner, Beachbody coach business super binder, Edit-able coach business planner? I actually have the differences listed here for all but the Epic business planner. 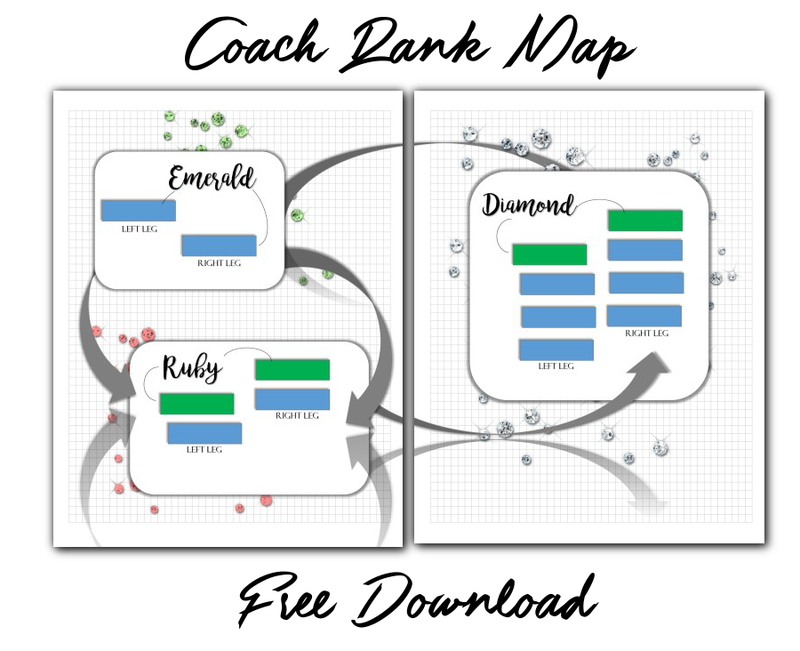 http://www.coachmmorris.com/p/coach-business-planners.html The coach binder and ultimate coach planner are virtually identical the only real difference is font. The editable one can be filled out on your PDF viewer and printed out. It is more condensed than the rest. The yearly business planner is more of a tracker when it comes to social media (you are basically tracking your time on each network instead of having network specific planning sections. The Epic planner however is SUPER updated and a LOT more modern. I personally feel it's a LOT easier to use the social media planning section in this one vs the others. The real difference with this one is it can be used for any business. It isn't Beachbody specific... and includes lots of extra business pages that aren't included in the others! I personally use this one now! Wow! It looks like it's very easy to organize your life with these planners. I saw something like that on https://www.lordofpapers.com/, but yours look much easier to manage. Thanx a lot! Good. But click here for even more! I am one hell of a person for "planning" and the phrase " If you fail to plan you plan to fail" has always been my motto. So right at the initial stages of my venture, I hit upon good business ideas I was ecstatic. I got a ready reckoner for how to regularly monitor all the key elements of my business e.g; setting business goals, doing monthly reports, templates to manage social media and contacts, etc. 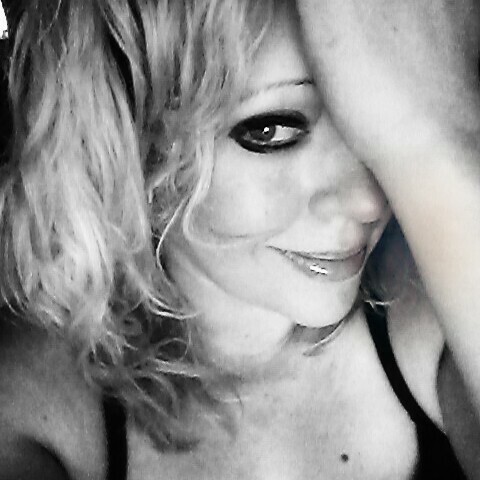 Yippee am on my way to success now!! I must say a very amazing and data oriented article your content team has written. Must appreciated work done here. FD is one of the best outsource graphic design service with great portfolio. DA STUDIO is a mobile application company in Dubai specialised in conception, UI/UX design, mobile app development, web development, webapp, ecommerce website, corporate website.